(Rose M. de Forest [Mrs. Augustus de Forest], New York); purchased 8 April 1922 by Thomas B. Clarke [1848-1931], New York; his estate; sold as part of the Clarke collection 29 January 1936, through (M. Knoedler & Co., New York) to The A. W. Mellon Educational and Charitable Trust, Pittsburgh; gift 1947 to NGA. Exhibition of Portraits by Early American Portrait Painters, The Union League Club, New York, 1923, no. 15. Portraits by Early American Artists of the Seventeenth, Eighteenth and Nineteenth Centuries, Collected by Thomas B. Clarke, Philadelphia Museum of Art, 1928-1931, unnumbered and unpaginated catalogue. Painted by F. R. Spencer: A Retrospective Exhibition of the Work of Frederick R. Spencer 1806-1875, Fountain Elms, Utica, New York, 1969, no. 16 (exhibition co-sponsored by Munson-Williams-Proctor Institute and The Oneida Historical Society, Utica,NY). Portraits by Early American Artists of the Seventeenth, Eighteenth and Nineteenth Centuries, Collected by Thomas B. Clarke. Exh. cat. Philadelphia Museum of Art, 1928, unnumbered. Crosier, Susan C. A Retrospective Exhibition of the Work of Frederick R. Spencer 1806-1875. Exh. cat. Oneida Historical Society, Utica, New York, 1969. American Paintings and Sculpture: An Illustrated Catalogue. National Gallery of Art, Washington, 1970: 100, repro. American Paintings: An Illustrated Catalogue. National Gallery of Art, Washington, 1980: 224, repro. American Paintings: An Illustrated Catalogue. National Gallery of Art, Washington, 1992: 340, repro. Torchia, Robert Wilson, with Deborah Chotner and Ellen G. Miles. 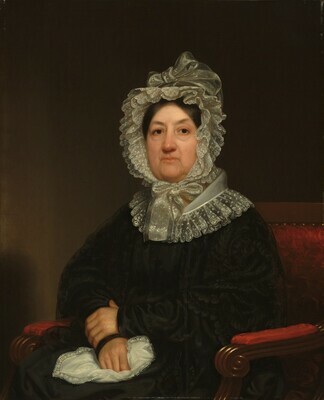 American Paintings of the Nineteenth Century, Part II. The Collections of the National Gallery of Art Systematic Catalogue. Washington, D.C., 1998: 129-131, repro.